Grow You a Big Web of Wires is a simple project built from copper tape, an Arduino Micro, lots of LED lights and a mess of wires. I wanted to explore what our homes and indoor spaces might look and feel like with the artifice of nature. This project was part sculpture, part installation and part futures imagining. 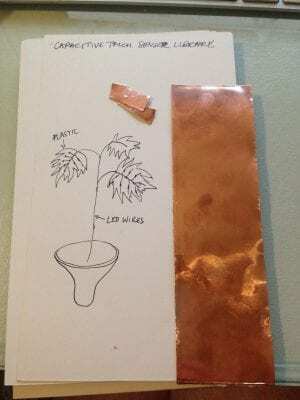 The leaves of the ‘plants’ are made of conductive copper tape that activate string LED’s when touched together. They are beautiful, but not alive, nor do they clean the air. The leaves look like leaves, the wires look like roots, but at best, they are a facsimile. The plants are meant to spark conversations about the place of nature’s contribution to our indoor lives. In my initial thinking about this project I wanted to explore the gestures and communication design of plants and trees in nature. How do we think about communication methods of nature? How can we use these notions to improve the way we as humans communicate? How does the medium of physical technology change how we interact with these creations? What are these things that plants talk about? Imagine a conversation between a pair of plants. I began by imagining how these plants would look. I knew that I wanted to recreate the way traditional house plants look in our homes. I went to source some wire at the hardware store and came back with 8 meters of galvanized steel wire. The galvanized steel was pliable and easy to cut, but was VERY messy! 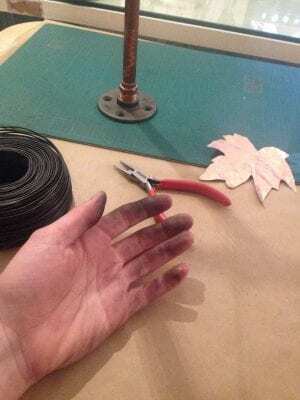 I began manufacturing many leaves for the tree form. It reminded me of a beautiful fall day, but not quite. I began sculpting with the galvanized wire and had initially had an idea of a tree shaped from a thousand wires all twisted together, however it proved more difficult than I had hoped. It could certainly happen, but would take much more time than I had. So I settled on creating a tree form out of some copper pipe I had laying around, then wound the steel wire around and through the pipe to create a base sketch of a tree. Taking cues from the plants in my house to structure the stems and leaf patterns. 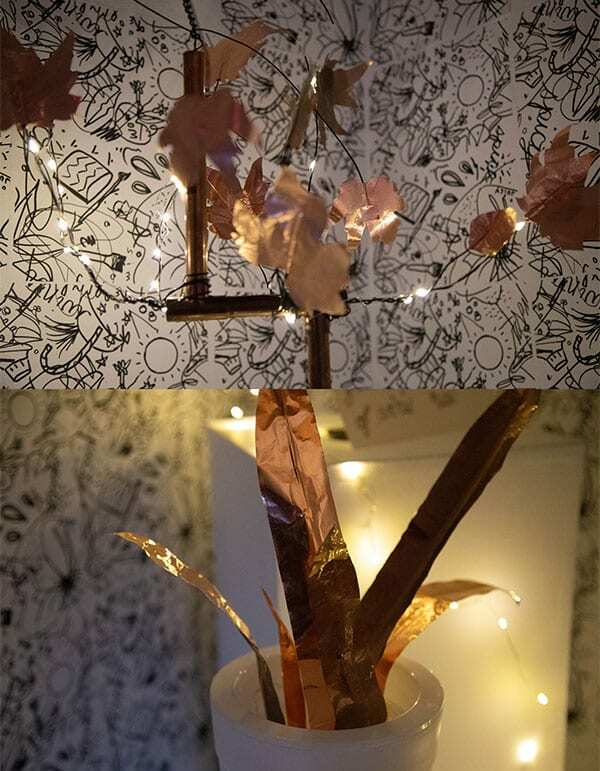 In creating this tree form I had a good contemplation session about how different metal is compared to plant life. After building the form of the tree I began another plant. 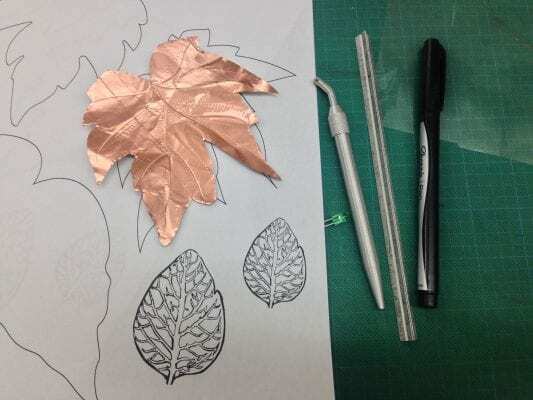 In working with the copper tape while making the leaves I began to get a sense of the best way to use this material. I keep some Sanseveria plants in my home in the places where there is not a lot of light. They are an extremely hardy plant with beautiful sculptural leaves. These plants don’t need to be watered often and can live through almost anything, it seemed like an excellent candidate to recreate. 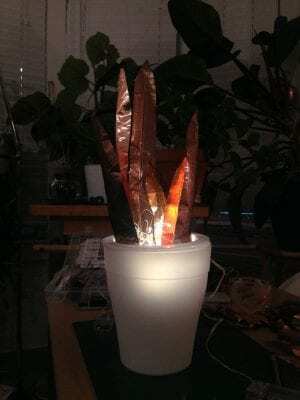 Using big long pieces of copper tape and solid core wire I began to form the plant by making leaves of different lengths and anchoring them in the plant pot using a base made out of a plastic lid. My first Sanseveria leaf and my first proof of concept using a copper tape switch and a simple pullup resistor connection. The circuit for this project was graciously offered to me by Veda Adnani from her project The Kid’s Puzzler. It was quite a simple set up utilizing the digital pins on the Arduino Micro. 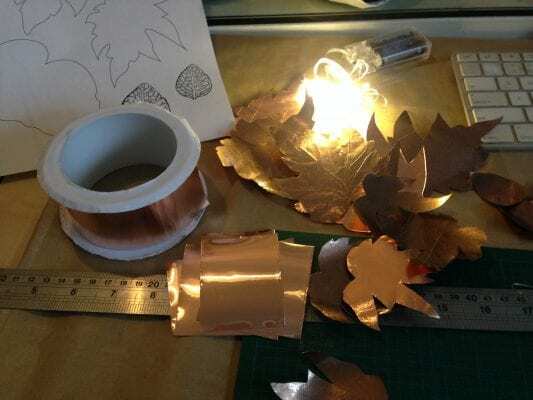 It was easy to create the proof of concept, however, there was much testing to be done with the copper tape once it was formed into the leaves and attached to the LED’s. There was a lot of real world differences once the circuit was connected. Sometimes the copper didn’t make a connection, sometimes the LED wires didn’t connect in the breadboard. It ended up taking a lot of troubleshooting and patience to come up with a setup that would work every time. The second part of this project was the actual installation of the plants. I had decided on displaying this work in the hallway between the Experimental Media Room and the main Graduate Gallery, this is a transitional space that could be peaceful and allow the viewers to have a quiet moment in the dark to reflect on these plants. The one issue I had been wrestling over all week were the walls, which were covered in a wheat pasted repeat pattern created by Inbal Newman. I had huge plans of covering the wall in large paper, or a projection, or even hanging a long white curtain in front of the work. 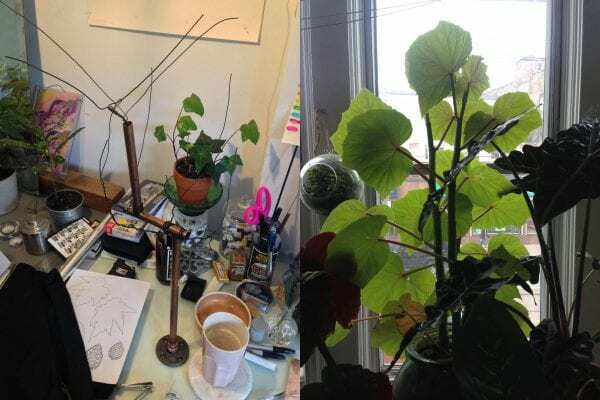 But through the process of making the wire plant I realized that Inbal’s art and my creations had a good synergy, that complemented each other, so I began to wonder if the works could be incorporated together. The final display was directly in front of the piece and it did work well. The title card in front of Inbal’s wheat paste wall. The whole scene lit up and ready to glow. 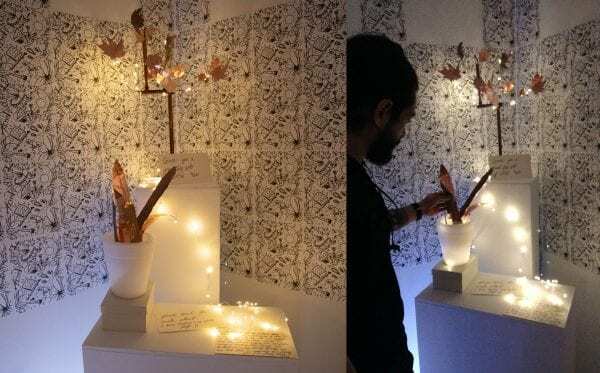 The installation was quiet and contemplative; the two plants were placed on plinths with the title and info cards next to them, there was a mess of string lights everywhere. There was a lot of positive feedback. I was happy with the installation as a first iteration; but much like the first iteration of Grow You a Jungle, I want to go bigger! I am envisioning this project in a room with a multitude of copper plants, perhaps setting up a kitchen or bedroom area as the setting. 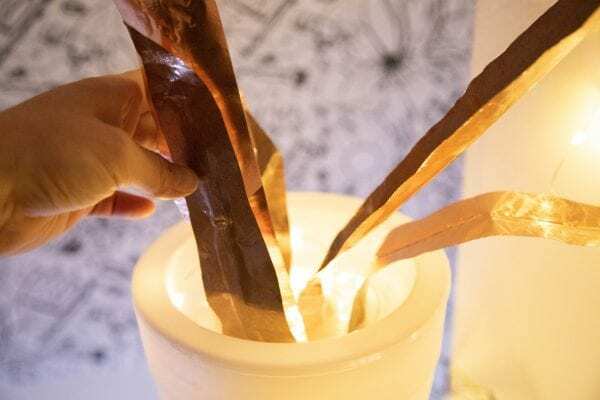 In the future I would like to join the two projects together, using real plants as a switch for sound and the copper plants as a switch for light, creating a cycle of dependancy between the plants and humans. One of the first projects I researched while thinking about this project was Botanicus Interacticus, a multi-faceted work funded by the Disney Research lab. 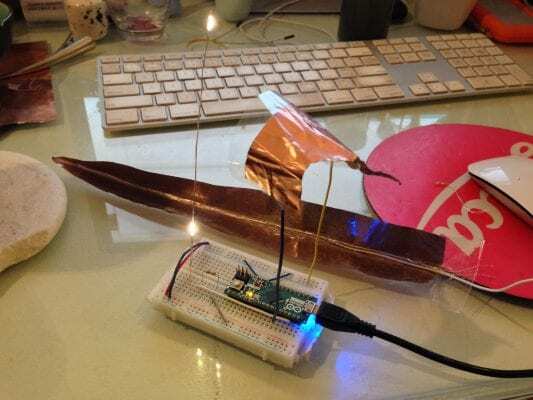 This project uses the electrical currents in plants to enable a person to create music by touching a plant. They also created artificial plants that responded to touch. It was a look at how we can program interactivity into the world around us using the electricity that inherent in the world. I was interested in understanding how our gestures could be examined and used to reveal new ways of connecting to nature and this project was a big influence on my thinking. 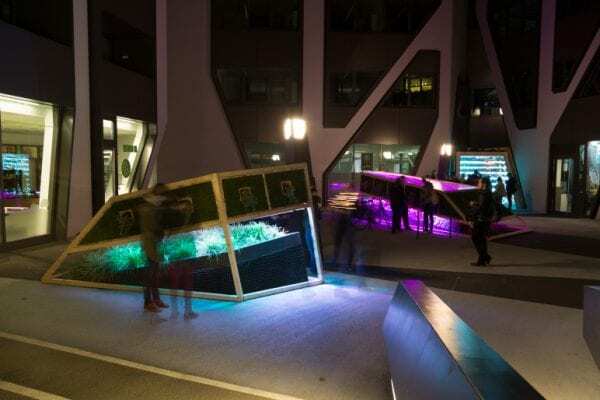 Sonnengarten is an interactive light installation that reveals the relationship of plants and light. When a user presses their hand against the plant installation, “for a short time the plant is symbolically deprived of its energy of live.” (Sonnengarten 2015) so the light in the installation changes. 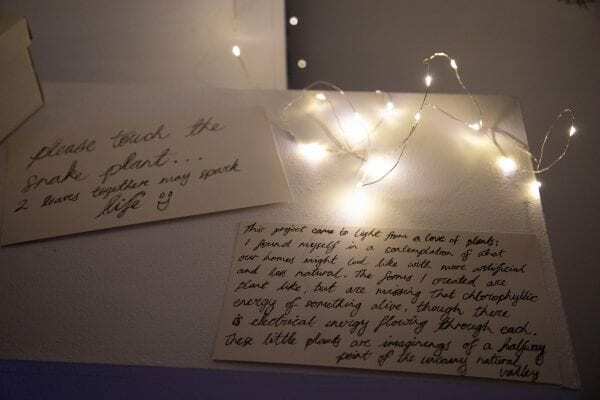 This project had me thinking about how the lack of light indoors can affect a plants growth, and how it’s survival is reliant on the person taking care of it. 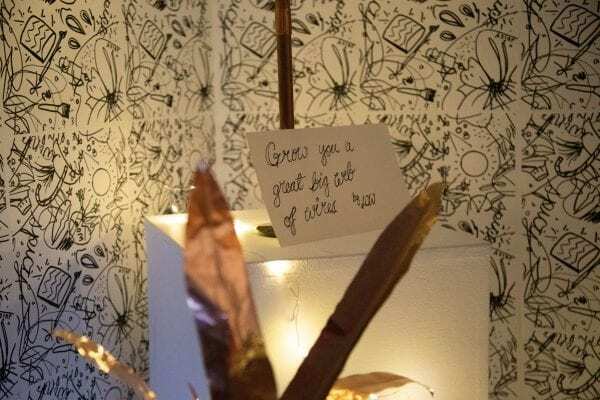 The cycle of dependancy came to mind, and I began to think about how to connect the ideas from Grow You A Jungle to this new project. This project was actually a lot more challenging than I initially expected, and that was mostly due to working with the copper tape. It was an exercise in learning your material and pushing it to the limits of its use. In working with the circuit and doing all the troubleshooting I came to a stronger understanding of how to fix connection issues. Something as small as a solder connection needs to be checked in the process of discovering the problem. Adnani, Veda. “The Kid’s Puzzler.” Creation and Computation 2018, 2018, blog.ocad.ca/wordpress/digf6037-fw201802-01/2018/11/the-kids-puzzler/. Laskow, Sarah. “A Quiet Revolution in Botany: Plants Form Memories.” Atlas Obscura, Atlas Obscura, 9 Jan. 2018, www.atlasobscura.com/articles/plant-memory-hidden-vernalization. Portocarrero, Edwina, and Gershon Dublon. “ListenTree.” ListenTree, 2015, listentree.media.mit.edu/. Poupyrev, Ivan. “Ivan Poupyrev Botanicus Interacticus.” Ivan Poupyrev » Botanicus Interacticus, 2012, www.ivanpoupyrev.com/project/botanicus-interacticus. Sato, Munehiko. “Botanicus Interacticus.” Munehiko Sato, 3 Aug. 2015, www.satomunehiko.com/works/botanicus-interacticus/. Taylor, Christie. “When Plants Sense Danger, They Cry Out With Calcium.” Science Friday, 2018, www.sciencefriday.com/segments/when-plants-sense-danger-they-cry-out-with-calcium/. Thompson, Stuart. “Scientists Create Electric Circuits inside Plants.” The Conversation, The Conversation, 18 Sept. 2018, theconversation.com/scientists-create-electric-circuits-inside-plants-73711.